Enjoy a cup of tea alfresco whilst soaking up interrupted views of farmland and woodland from the garden of this beautifully restored former Methodist chapel. 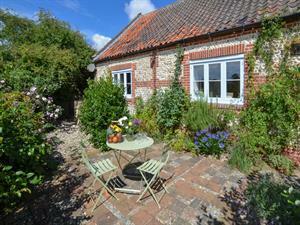 Located in the pretty village of Hindolveston only 8 miles from the Georgian town of Holt this former Methodist chapel offers blend of traditional and new, and provides stunning accommodation perfect for a relaxing break in the countryside. If you seek traditional seaside fun head to the stunning North Norfolk coast where the sea meets the sky, meander on foot along the North Norfolk coastal path, and enjoy a few seasonal delicacies along the way such as crab and Samphire in the summer months. Whatever you decide to The Old Chapel makes a perfect base to return to at the end of a busy day! Pretty patio area with table and chairs - perfect for a spot of lunch!